Clement Clarke Moore's poem 'Twas the Night Before Christmas has forever imprinted in our minds that Christmas stockings should be "hung by the chimney with care." But not everyone has a fireplace in the home. Where can you hang your stockings during the holiday season if you don't have a mantel? There are non-conventional ways to hang stockings that work no matter what kind of home you live in. An advantage of these methods is that many of them can be used throughout the year for other purposes. Here are some ideas for stocking holders. Maybe you've got no fireplace mantle, but surely you've got a door somewhere. It can be the inside of your front door or an interior door. Choose a door that faces your main living area, and use wreath hangers or over the door hooks to hand your stockings. We had no where to hang our stockings, and I devised this plan out of necessity. As I unpacked the Christmas things, I laid the stockings to the side (yes, ours are super-sized), wondering where I would put them. Then I unpacked the wreath hangers, and "BING!" a light went on on my head. Perfect solution! You can even personalize the wreath hangers for each member of the family as my daughter did. I know that we break the cardinal stocking hanging rule -- Make all the toes go the same direction. 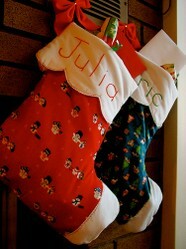 I find that boring, so my stocking faces in towards my daughter's and my husband's stockings. 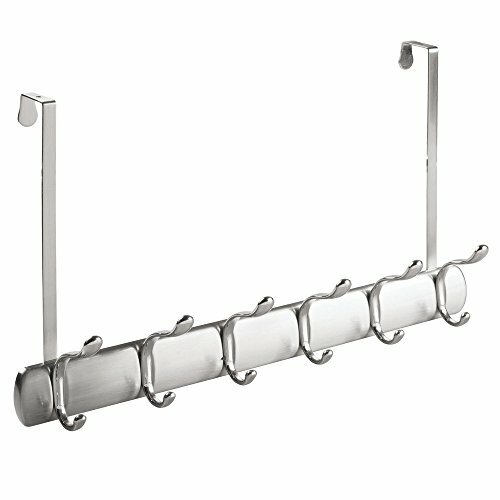 Another practical idea for hanging stockings when you have no mantel is to use regular wall hooks. The ones featured below are attractive enough to be hung on your living room wall. 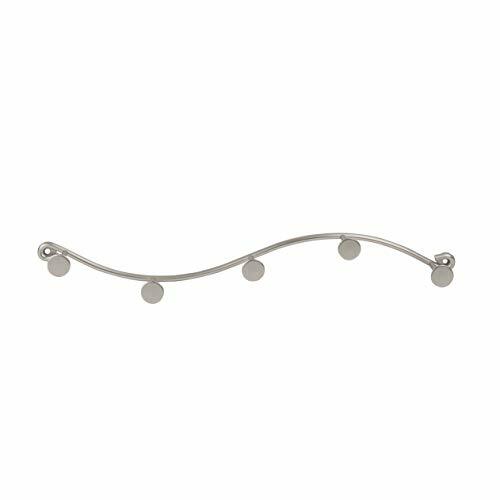 When Christmas is over, you can hang other home decor on the hooks. 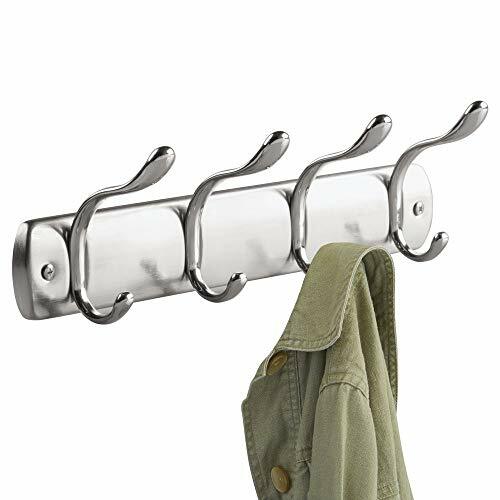 A coat rack makes a great stocking holder! It has several advantages over other methods. 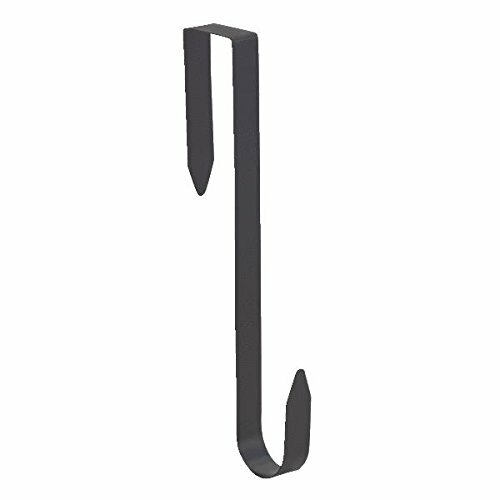 If your family is large, or you have lots of pets who have their own stockings too, a coat rack can handle them all. 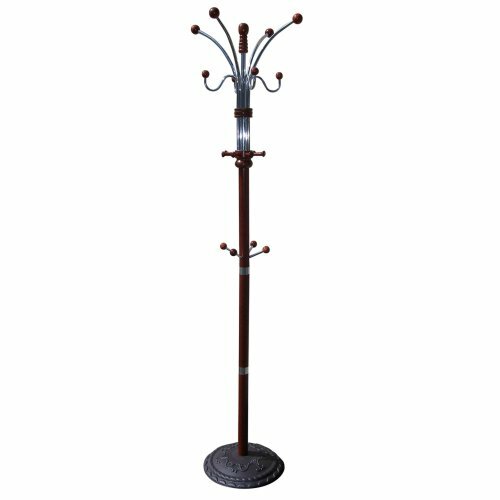 The coat rack can become a normal coat rack after the holidays are over. There is no need to store it away in the attic or basement (although you certainly could do that). With the coat rack method, you do need a bit of floor space, but not a lot. An odd corner or even a spot by the Christmas tree will do. When you hang your stockings, be sure to distribute them evenly around the rack so the weight is even. 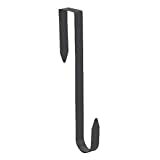 And unless your coat rack is ultra sturdy or your stockings are super light, remove them from the rack when you (or Santa's elves) fill them. Some great ideas. I like your unusual ones. The stockings will be safer away from the fire although I know Santa will have further to walk from the fire. I really like the door hanger idea. We do our down the stairway that just happens to be above our buffet/tv area..the trouble is they sometimes fall behind and we have to go on a fishing expedition.